QNC, Inc. offers an addition to its successful line of hot-air fryers, the new Model GF5. This model has almost twice the capacity of previous Quik n' Crispy® Greaseless Fryer models, allowing operators to prepare up to five pounds of menu items per batch in just three to six minutes or up to 35 pounds of french fries per hour. In today's health-conscious market, it's also important to note that fried foods prepared in the Quik n' Crispy® can have 20 percent to 50 percent less fat than foods prepared in deep-fat fryers. Taylor Company, one of the world's leaders in frozen dispensing equipment, offers the new Model C903, a totally automatic, two-flavor frozen beverage system. Simply add ready-to-use (RTU) concentrated liquid mix or a bag-in-box product, and the completely self-contained unit automatically fills the visual bowls from a lower refrigerated cabinet. The C903 is capable of handling a wide variety of dairy and nondairy products: frozen cappuccino, fruit-based or noncarbonated fountain syrups. With double the capacity of most visual display freezers, this is an effective choice for higher volume applications. The tamper-proof, sealed system assures food safety. Polar King manufactures portable outdoor walk-in coolers and freezers for the food-service industry and other related industries. Every unit is 100-percent seamless and constructed of FRP fiberglass, delivered pre-assembled, pre-wired and ready to operate on delivery. Units are available in various sizes and temperature ranges and can be custom-built per customer specification. With more than 20,000 locations that serve fresh, great-tasting, made-to-order sandwiches, Subway is recognized for offering a healthful alternative to fatty fast food and is a popular destination for consumers worldwide. Subway has been named the number-one franchise opportunity by Entrepreneur magazine for 12 of the past 16 years, making it an undisputed leader in the submarine sandwich category. The Subway concept offers flexibility in size, location and investment. For nontraditional operators, the ease of operation and low startup costs of a Subway franchise are important advantages. Electro Freeze machines offer superior engineering for making soft-serve, yogurt, shakes, slushes, smoothies and frozen cocktails. The gravity and pressurized machines are precision-built for dependability. The easy-to-clean unit has the Freedom 360-degree Series mix transfer system, effective for serving loads of soft-serve, custard, frozen yogurt and Italian ice. Dispense two separate flavors or the popular twist. Two 3-quart freezing cylinders and the 2.0-horsepower compressor provide fast freeze-down and energy savings. Star's Grill-MaxTM Electronic Roller grill has built-in intelligence from electronic controls that deliver improved food safety, enhanced food quality, labor savings and reduced food waste. When the grill reaches its serving temperature, an audible alarm sounds, and the grill automatically switches to the hold setting. 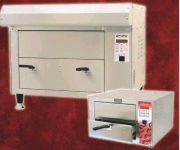 Precise multi-zone temperature control allows for product temperatures ranging from 145 degrees to 190 degrees, holding food at a safe serving temperature. An industry-leading LED display provides product temperatures for both cook and hold cycles.